To under­stand acne, it always helps to under­stand what our skin was meant to do in the face of a par­tic­u­lar con­di­tion, and then sup­port it in going back to that level of func­tion­ing. To detect poten­tial stress — nervous sys­tem cells detect stress – and dir­ectly inter­face with our hor­mone sys­tems through cortisol (our stress hor­mone)! Close-up view of the sebaceous gland. Where can these methods of protection work against us? 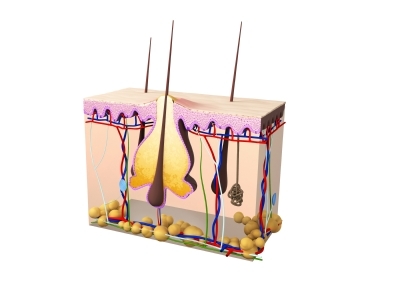 Overactivity of our sebaceous glands (glands that pro­duce oil in the skin). The sebaceous gland has enough enzymes and essen­tial fats with­in it that cho­les­ter­ol can pro­duce testoster­one, which in turn pro­duces more oil. Knowing these things, what does this have to do with our digestive tract? Our digest­ive tract is cap­able of pro­du­cing bac­teria in the digest­ive tract that dir­ectly influ­ence the skin and its own colony of bene­fi­cial bac­teria. These bac­teria are cap­able of redu­cing inflam­ma­tion, sup­port­ing immune defense, and pro­duc­tion of essen­tial nutri­ents and vit­am­ins. We know that there are immune molecules in the digest­ive tract that influ­ence the total amount of vit­am­in D in our body. Vitamin D, when not absorbed strictly through the skin can be inges­ted and is able to boost the skin levels of vit­am­in D. Vitamin D increases cer­tain molecules called catheli­cid­ins in the skin sur­face that act like immune boost­ers, and dir­ectly increase immune cells which kills cer­tain bac­teria. This is import­ant for acne as the bac­teri­um P. acnes is known to col­on­ize sebaceous (or oil-pro­duc­tion) follicles, which can lead to infec­tion and the hot, sore break­outs that are more cyst­ic in nature. As much as we all love dairy products, and they are import­ant for cal­ci­um and as a pro­tein source, they are known to worsen acne. Dairy products con­tain ster­oid hor­mone pre­curs­ors to testoster­one that drive sebaceous gland func­tion­ing, includ­ing oth­er growth factors. If you think about it, it is milk from an anim­al used to help nur­ture and grow their infant (cow, sheep, goat), and as a res­ult it will have hor­mones that can influ­ence your own hor­mone path­ways. Insulin growth-factor 1 is elev­ated when milk is con­sumed through an elev­a­tion in blood sug­ar and insulin levels. This is most pre­val­ent in teen­aged years when ster­oid hor­mones are more act­ive. Cortisol, a stress hor­mone, is dir­ectly involved in the increase in insulin, and so not only is milk or milk products affect­ing hor­mone pools in gen­er­al, but add in a pinch of stress and things really get going. Sugar always makes acne worse. It basic­ally per­mits inflam­ma­tion to increase and run freely. So, what do we do to reverse these processes? Reducing inflam­ma­tion through­out the body. Fish oil is an essen­tial fat, mean­ing if you do not get get it through your diet, you will not have it! Fish oil is anti-inflam­mat­ory, work­ing in the same path­way that can Advil. With time, a reduc­tion in the num­ber of break­outs as well as red­ness and swell­ing in the area of the gland is facil­it­ated. This will not only facil­it­ate immune bal­an­cing and bene­fi­cial immune cells, but also ensures we are hav­ing adequate bowel move­ments daily. Our skin is an organ that does elim­in­ate wastes (through sweat); if the digest­ive tract is not mov­ing reg­u­larly this does impact the skin. Many herbs can assist the endo­crine (hor­mone) sys­tem to become more bal­anced, with the guid­ance of your doc­tor. Echinacea spe­cies are known to sup­port the growth of good immune sys­tem factors at the same time as redu­cing inflam­ma­tion. Studies are show­ing that with con­tin­ued use it can act sim­il­arly to an anti­bi­ot­ic in redu­cing the infec­tion num­bers at the skin sur­face. With all skin con­di­tions, the true trig­gers for each per­son are unique. Patience is undoubtedly one of the most import­ant vir­tues in get­ting acne under con­trol.